New research on role of sexism in 2016 election. New data show how sexism played a role in Donald Trump’s election. 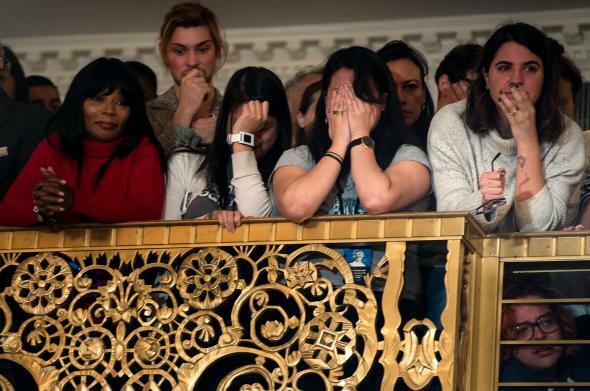 Staff and supporters listen as Hillary Clinton speaks at the New Yorker Hotel in New York on Nov. 9, after her defeat in the presidential election. Maxwell’s gender-based analysis of the Blair Center Poll’s results for this year has just been released, and it shows that sexism absolutely did matter. Trump’s voters were more sexist than Clinton’s (and Ted Cruz voters were even more sexist than Trump voters). Republicans were far more sexist than Democrats. White respondents were more sexist than black Americans and Latinos. Female respondents, not to be outdone, were also quite sexist! And Bernie primary voters who didn’t vote for Clinton in the general were more sexist than those who did. Over the years, Maxwell noticed a majority of Gallup and Pew respondents consistently answering yes to the question “Do you think you’ll see a female president in your lifetime?” So she wondered, as she told me, “If sexism is just gone, or we’ve just kind of gotten over it, and we’re just so OK with a female president, how come there hasn’t been one?” Starting in 2012, Maxwell asked the Blair Center Poll respondents to answer five questions culled from a tool called the Modern Sexism Scale. The respondents to the poll ranked their responses to these statements on a scale from “strongly disagree” to “strongly agree.” The researchers classified respondents as “sexist,” “neutral,” or “nonsexist,” based on their overall scores. Interestingly, fewer Sanders primary voters than Clinton primary voters were “sexist,” according to the scale. But when the general election came around, a model that used the Modern Sexism score was “highly significant” in predicting the 25 percent of Sanders voters who did not swing to Clinton. Sanders voters who voted for Trump in the general election had higher mean Modern Sexism scores, followed by those who swung to Gary Johnson. In the general election, a high Modern Sexism score was very predictive of a decision not to vote for Clinton (or for the other female candidate, Jill Stein, who got only 1 percent of the vote in the sample). Among almost all the subgroups of voters in the sample, being “sexist,” according to the scale, moved you away from a Hillary vote. (Latinas and black Americans of both sexes didn’t seem influenced by their sexism scores in casting their votes.) So even controlling for all other variables, the researchers found that a Republican man who is strongly sexist had only a 10 percent chance of voting for a woman. I confessed to Maxwell that these results have me depressed. “Modern Sexism is really about animosity and distrust toward successful women,” she said. “Because if you’re answering ‘yes’ to these statements, that you think they’re trying to get favors and they’re pretending about inequality … it’s distrust, it’s animosity, it’s resentment and frustration.” That’s why Donald Trump calls Elizabeth Warren “Pocahontas”—it’s a way of signaling that if she’s a powerful woman, she must also be a pandering liar. Working women have gone from “incapable” to “sly and corrupt.” I’m not sure it’s an upgrade.